As a guitarist, you sometimes need guidelines regarding which chords to play together. It is for this purpose a recommendation to know the relationship of chords in different keys, but some suggestion of chord progression could also come handy. Known songs and the artist is sometimes mentioned after a chord progression. This may make the progression more familiar to you, but it is just lesser parts of the song and mainly for fun. 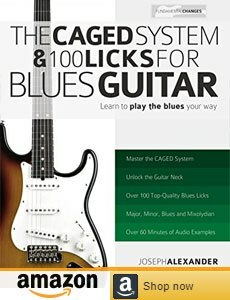 The key of C is one of the most common keys for a guitarist. One reason is that there are many open chords with unchallenging shapes – with F as a little trickier exception – that can be played together. You could also listen to playing examples with sound, however, these are only simple demonstrations. It is often possible to substitute G with G7, Em with Em7 and so on. If the sequence doesn't end with a C, it is because it can continue with additional chords or start over again alternatively resolve into an ending C.
The D major is another central key for guitarists. Many well-known songs such as “Bad Moon Rising”, “Summer of ‘69” and “Free Fallin’” goes in his key. Because the notes in the standard tuning (E, A, D, G, B, e) in a high degree coincide with the key of E, there are plenty of opportunities to find chord shapes in open positions. The key of E is often used in rock and metal situations; therefore, you could try some of these progressions with power chords. The key of F is less favored by guitarists since I (F) is often played as a barre chord and the same thing applies for ii (Gm) and IV (Bb). Therefore, it is not one of the central keys from a guitar perspective, but there are some chord progressions worth knowing nevertheless. The A chord doesn't belong to the F major key, but can be played in some situations. Also, Fm can work as a non-diatonic chord in this key. G major is perhaps the most viable of all keys for a guitarist. Especially when playing open chords is this a very convenient key. Lots of famous songs composed in this key exists, some of them are “Knockin’ On Heaven’s Door”, “Brown Eyed Girl” and “Wonderful Tonight”. Key of G is also very well suitable for country and bluegrass. The last major key to look on is A. It is definitely a useful key and common in music compositions with the guitar involved. One drawback is that the iii (C#m) can’t be played in any easy way as an open chord (except with voicings). C# minor can in some occasions be substituted with C# major. We will finally include two minor keys in this journey. We choose A and E minor because they are probably the most used minor keys when it comes to the guitar. A minor is relative to C major and it means that the same chords (plus for example D) can be used for this key. As for its relative key, G major, E minor is used in many famous songs. Three examples are “Heart of Gold”, “The River” and “Come as You Are”. There are of course much more chords and keys to learn and if you want to go more into depth a recommendation is the book The Guitar Player's Songwriting Bible.